At JE Pistons, research and development plays a key role in developing the strongest high-performance forged pistons on the market. 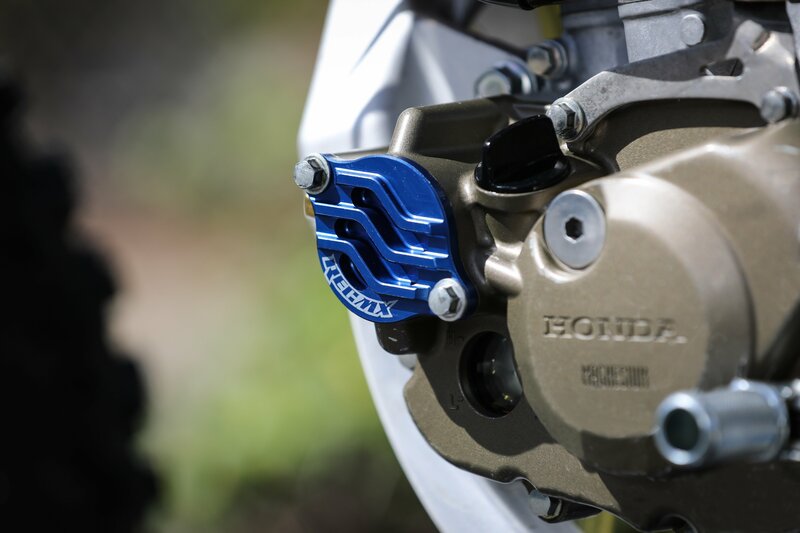 JE is well-known for their custom abilities when it comes to building pistons, but creating drop-in shelf parts that improve performance and reliability is equally as important, especially for the powersports market. Piston development goes through many steps of engineering, testing, and refining product features to reach a high-performance piston that lives up to JE standards. 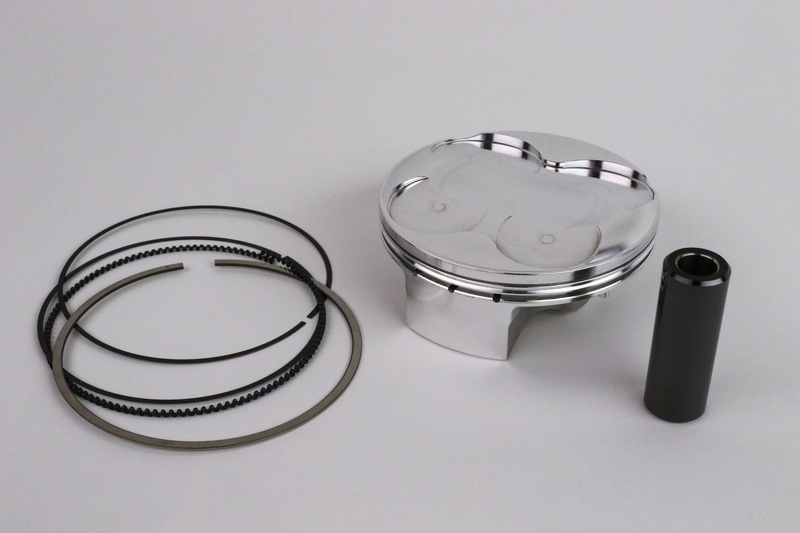 Beginning with an electronic scan and measurements of the combustion chamber and cylinder, pistons are designed in-house to optimize performance within the specifications of OEM motorcycle engines. After test pistons are designed and machined, actual engine testing is a critical step in understanding what is working well and what doesn’t. 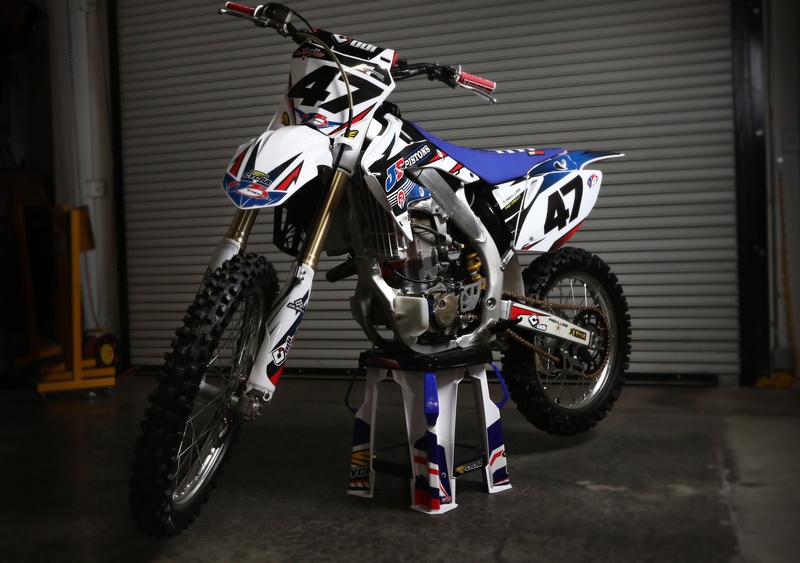 This testing for dirt bikes and other motorcycles alike is done through bolting up test engines to an engine dyno and recording and analyzing results. 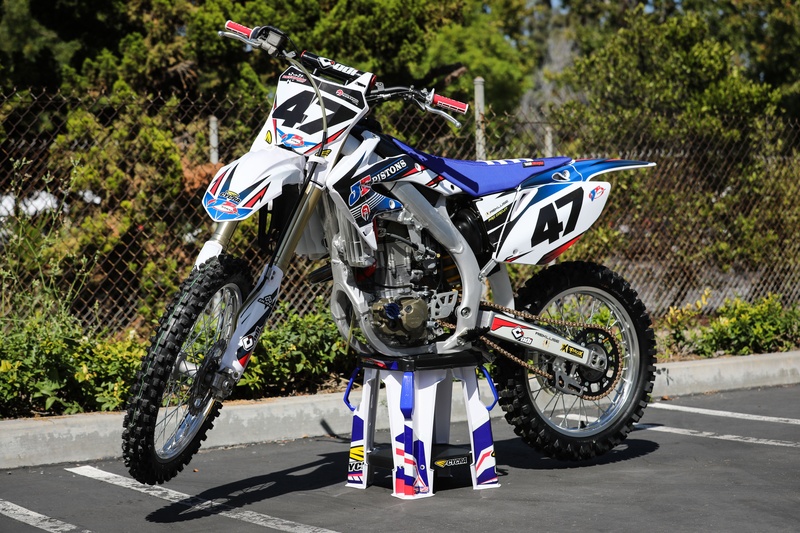 As we all know, technology in dirt bike engines is changing yearly, meaning engine designs become almost irrelevant in a short number of years. Because of this, JE Pistons has had an ex-dyno mule 2006 CRF450R sitting in the warehouse collecting dust for the past decade. The engine out of this bike was originally used for dyno testing purposes, aiding in piston testing and development. After walking by the seemingly brand-new Honda countless times, JE thought they should make some use of this machine, even if it means not riding it. So, a plan was quickly drafted to clean it up, bolt on some of the best goodies, and put it on display in the JE office to liven up the place a bit. 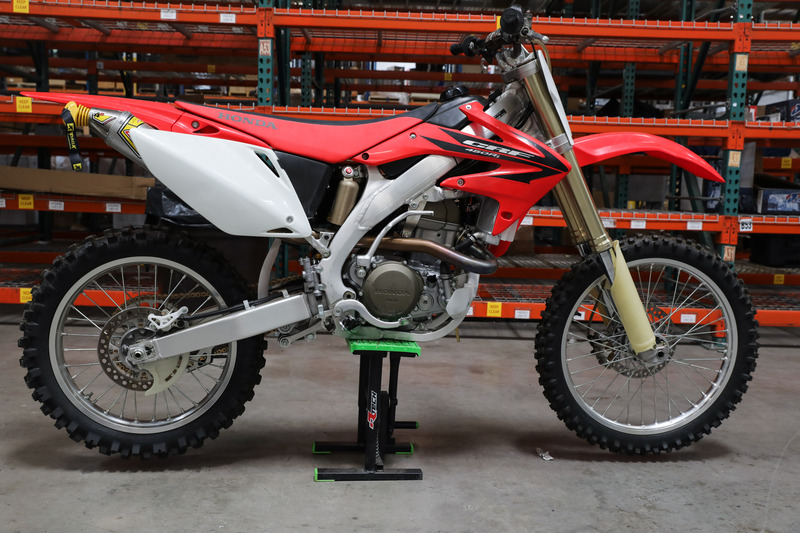 The 2006 CRF450R was sitting in the warehouse for a long time. It was only used for dyno testing, so it looked almost new, but definitely dated. JE reached out to some of their friends and partners in the industry to help with the bike’s makeover. First, a set of all-white Cycra Powerflow plastics—including a front fender and number plate from a 2018 CRF450R—were bolted on to give the bike a modern and clean look. Plus, the Powerflow design helps keep the bike cool should any of the JE crew ever decide to take the bike for a spin. The bike received a set of white Cycra Powerflow plastics, complete with an updated 2018 Honda front end conversion. 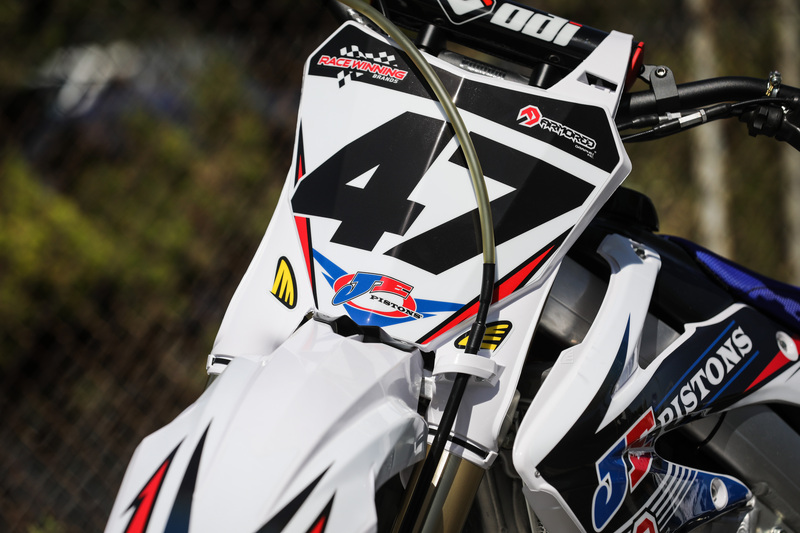 Armored Graphix took the wheel in creating a set of custom JE Pistons graphics for the Cycra plastics, complete with number 47, representing the year JE Pistons was established. The graphics were cut perfectly, look awesome, and went on without hassle. 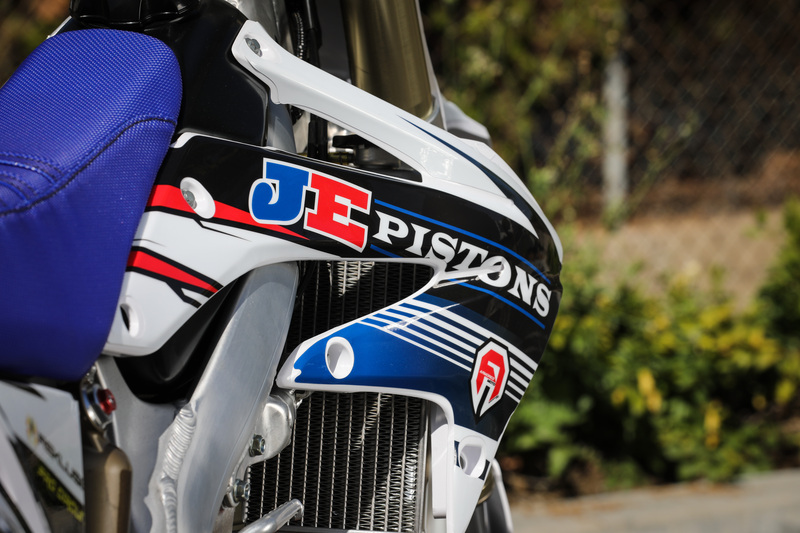 Armored Graphix created a fully-custom JE Pistons graphics kit for the Cycra plastics. 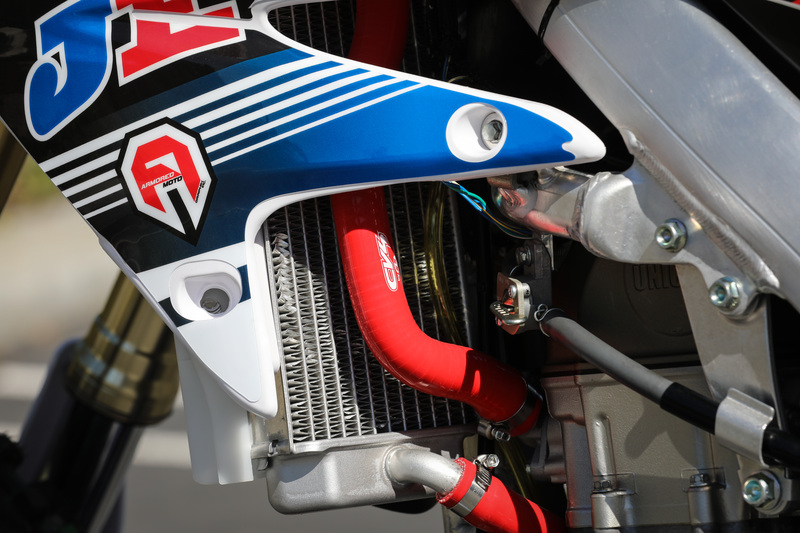 A set of red CV4 radiator hoses were fitted on the CRF machine, accenting the graphics and supplying peace of mind the hoses will stand up to any heat thrown at them. Red CV4 radiator hoses add a nice touch of color and an improvement for the cooling system. Of course, a fresh JE high-compression piston was installed after the engine’s dyno-duties were fulfilled. Find JE Pistons for your machine here. See more on JE Pro Series pistons here, and all about the forged advantage here. Rekluse took care of the clutch, getting the bike set up with a CoreManual TorqDrive clutch kit. This kit provides more disks in less space, allowing for an additional four friction disks over stock. More friction disks equals more torque capacity, translating more power to the rear wheel that can easily be felt by the rider. A Rekluse CoreManual TorqDrive clutch system improves power delivery, and the billet, anodized clutch cover helps the engine's aesthetics. The engine exhales through a Pro Circuit T4 stainless steel exhaust system, complete with a removable spark arrestor. 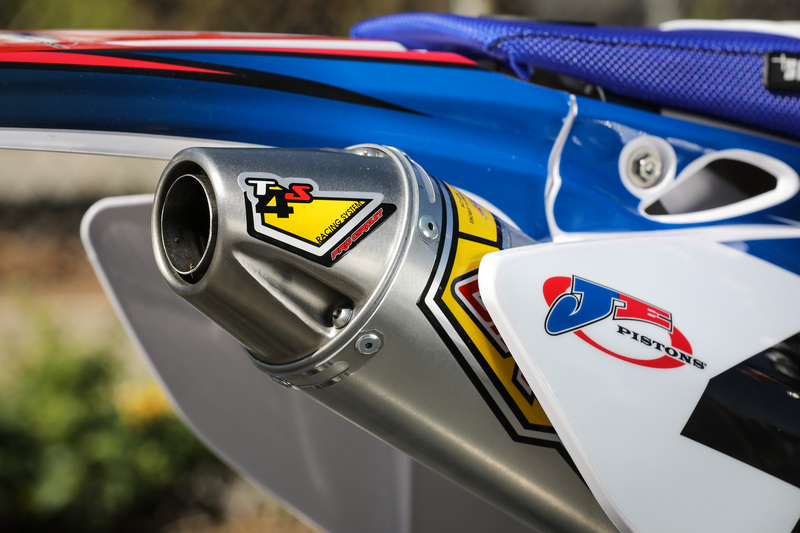 It was lucky for us that Pro Circuit still offers great exhaust systems for older bikes. The Pro Circuit T4 system may be an older style, but it still looks, performs, and sounds great. An anodized, billet oil filter cover from REC MX finished off the engine goodies. This oil filter cover has cooling fins to improve oil temperature control, as well as oil feed holes designed to keep the oil delivery unobstructed. The full billet, CNC construction adds a nice structural and visual touch. 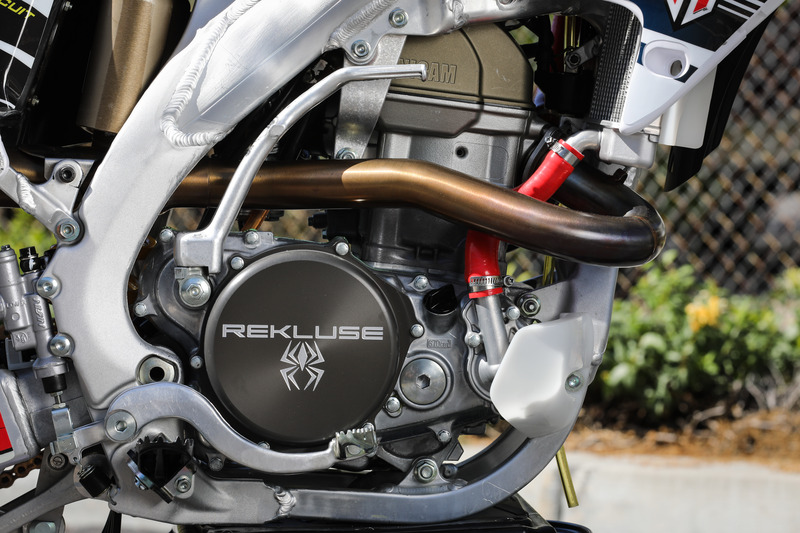 The REC MX billet oil filter cover improves cooling, oil flow, and adds a factory look. 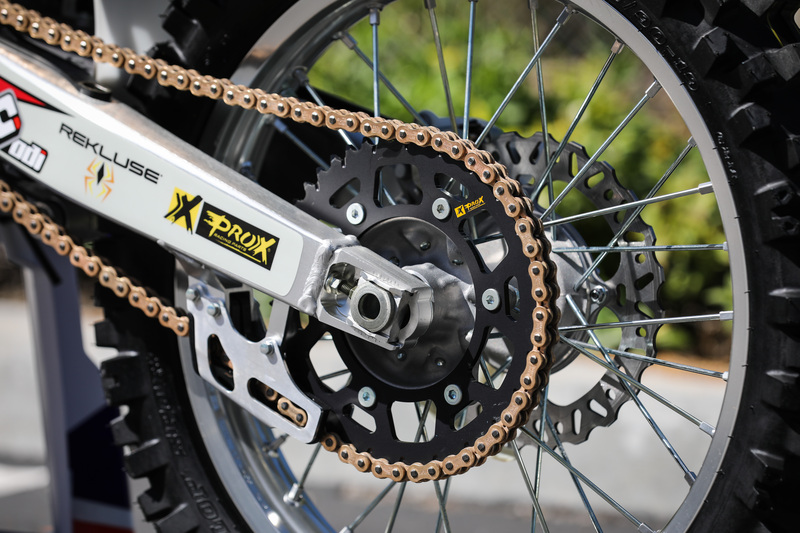 The folks at ProX Racing Parts hooked the bike up with a set of sprockets, a gold 520MX chain, and front and rear brake rotors and pads. 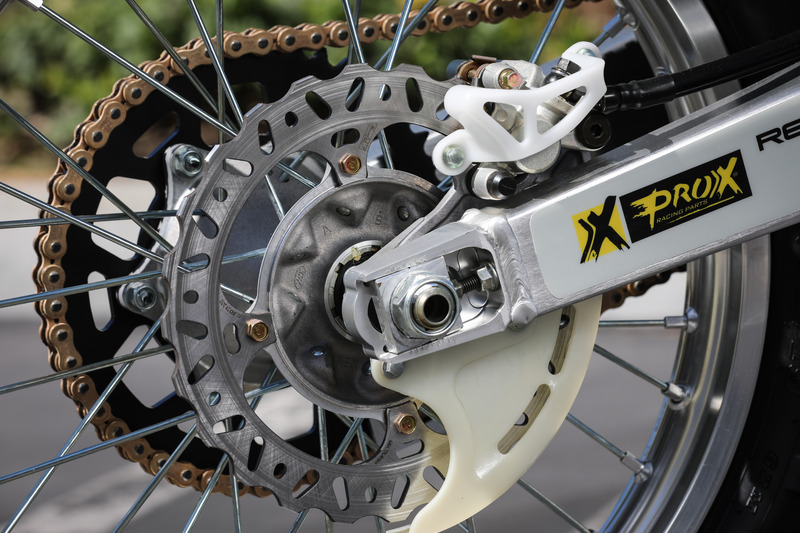 The rear aluminum sprocket is Teflon coated for additional wear properties, and the gold chain is as high quality or better than we’ve seen from the major chain manufacturers. The brake rotors’ wave design also provides improved stopping performance over the stock, solid-edged rotors. Front and rear ProX sprockets wrapped in a ProX gold chain drive power to the rear wheel, while ProX rotors and brake pads handle stopping. 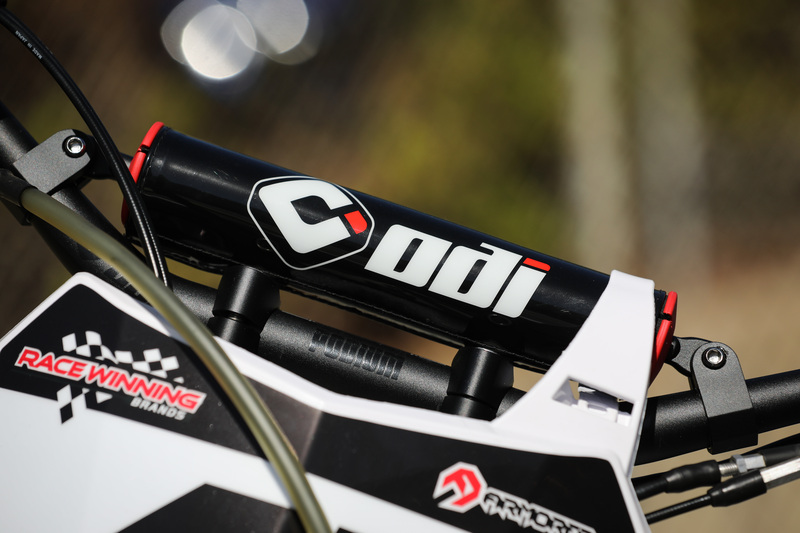 In the controls department, a set of Podium handlebars were bolted up to ODI bar mounts, featuring the ability to adjust flex in the crossbar, allowing the rider to achieve the feel they prefer. 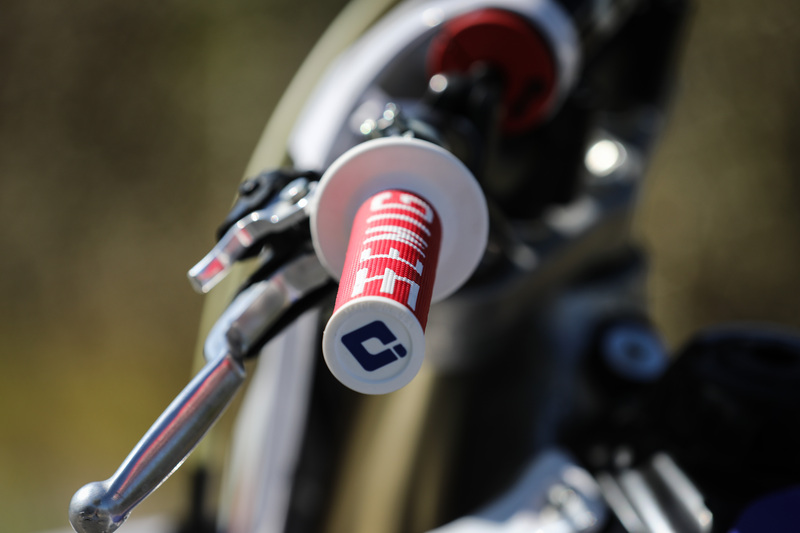 Finishing off the controls package is a set of white and red ODI EMIG47 lock-on grips, eliminating the hassle of dealing with grip glue. 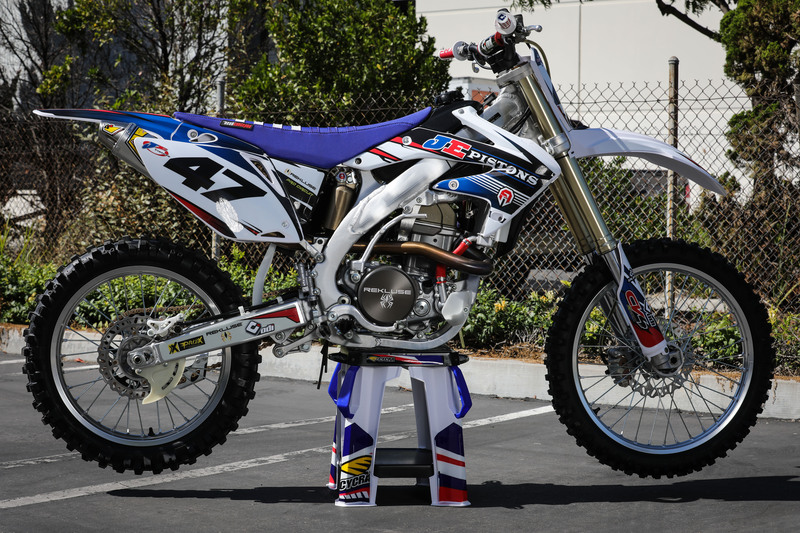 The bike's controls were upgraded with ODI Podium bars and bar mounts, along with EMIG47 white and red lock-on grips. The stock Honda seat was slippery and had bright Honda red sides that clashed with the new JE Pistons color scheme. 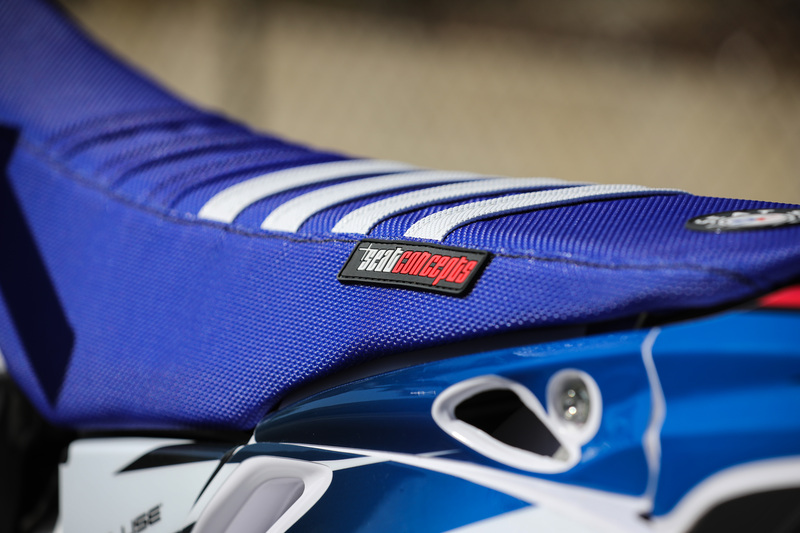 Seat Concepts built a custom blue seat cover with white ribs for added rider traction. The material is a huge improvement over stock, assuring more grip. 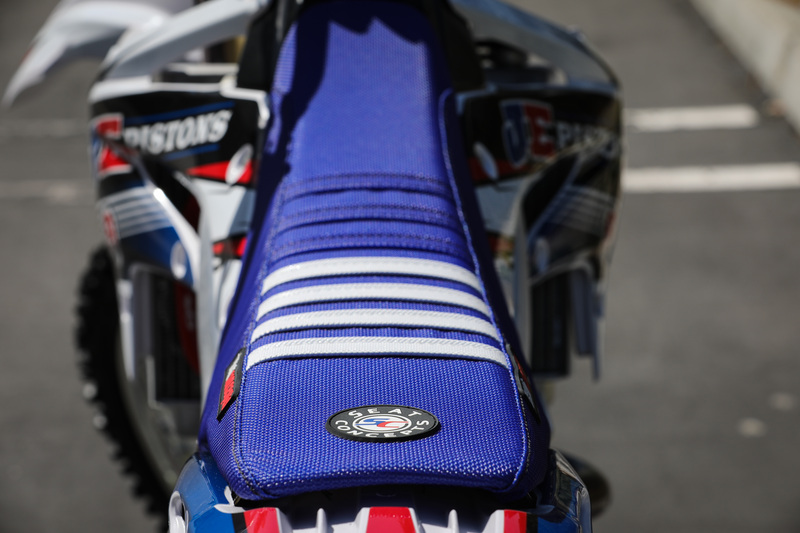 Seat Concepts built a custom seat cover with premium material and additional ribs for improved rider traction.